For a few years now the Amber and Bullock from Master Mechanic Markham have held annual toy drives. They help to support local families over the holidays through the Salvation Army. To start off this Season, ‎Markham and Markville donated the first gift — a new Xbox game system! Master Mechanic Markham & Markville are accepting donations of unwrapped gifts until December 16th! 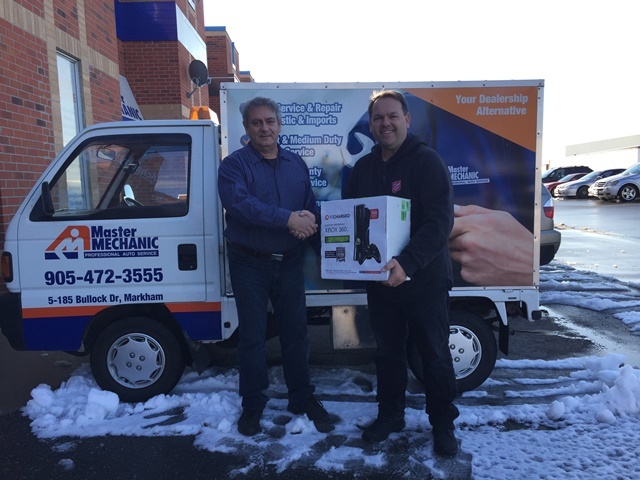 Every year Joe and Master Mechanic Markham & Markville teams make an effort to collect children’s gifts for a holiday toy drive. They are donated by customers and delivered to the Salvation Army in Markham before the holidays. The group usually collects a variety of mixed gifts for children from infants to teenagers, for all interests and genders. In addition to the gifts donated by customers, the shops top off the donations with either a cash donation and or a pile of more gifts. They also include some gift certificates for car repairs for those families who could use a little extra help with their car expenses. The inspiration for these efforts was to support the local families during the Christmas season. In return, helping many individuals and families through this tough time. “It’s just something we care about and we know the Salvation Army is a reputable organization. Visit Master Mechanic Markham & Markville to donate! Drop off an unwrapped toy and help a local family this holiday season!